We’ve asked you to “give us a word” for Durham, and vote for your favorites to select Durham’s 50-word manifesto for its future. Now, the 21 artists and we ask you again to support and participate in the creation of their work, inspired by the words you’ve selected. But who are these artists? what are they making? Glad you asked. For the next couple of weeks, we will be featuring the artists who are participating in Stitch to produce artworks from the words nominated for Durham. Today, we have a triple-header! Interdisciplinary artist & designer Tim Swezy is a recent translpant to Durham, by way of a couple of dozens (!) of places around the continental US, and expresses a deep admiration for the town: “Durham… has the best of what I love about big metro areas like Chicago and New York: great food, culture, and people mixed with the accessibility and livability of a small town,” he says. Truly curious and open to new ideas, he is dedicated to finding connections in disparate places and ideas. His idea: Pick your favorite Durham landmark and a STITCH word, and he will combine them into a preparatory drawing for a fictional (for now?) installation art project rendered in ink and art marker. Pictured to the left is his “prototype” drawing using the word “Stitch” and the downtown. Collaborate with him & virtually deface your favorite building, comment on an aspect of local culture, explore a slice of Durham’s psychogeography, or simply replace an ugly outdoor advertisement. He’ll be at Art Walk popup shop this weekend with several other participating artists. Please come and say hi! 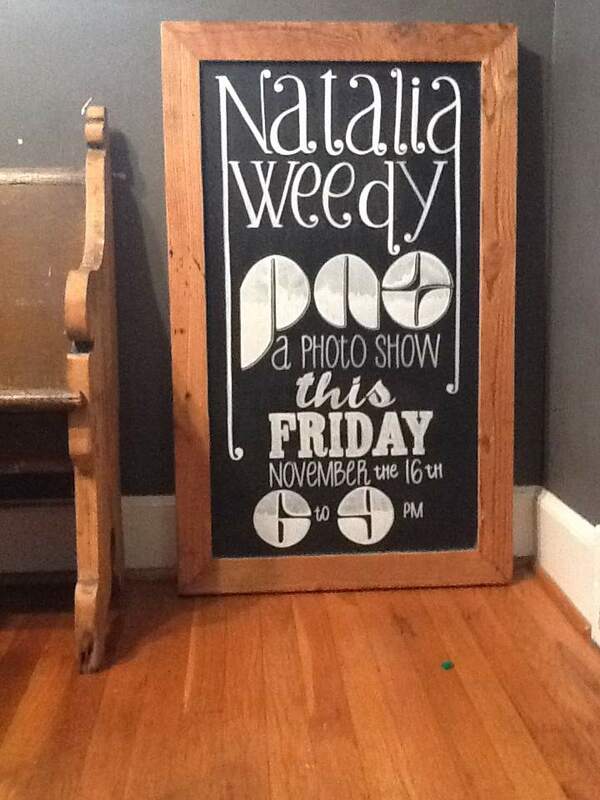 Her hand-lettered signs are truly works of art. 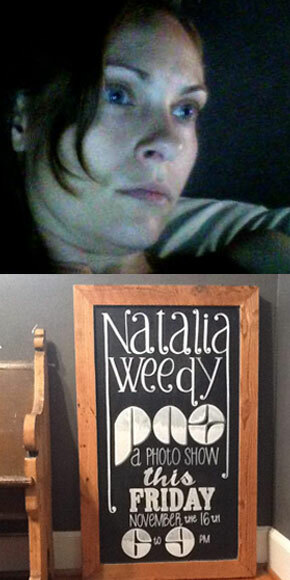 She says that the sign-making “has been a mostly secret way of sharing my art with Durham. This is good as I am very shy.” But she and I both agree that it’s about time for her to step out and show her face! Her Stitch special board will be on display at our Art Walk popup store this weekend as well. About their creative process, Erika explains: “We brainstorm whenever we see or hear something that inspires us. Then just get to creating.” I watched the whole process unfold at our Labour Love event, where we met and subsequently decided that they simply must participate. Erika and Jamaul huddled for a quick “what are we gonna do” conference, then Jamaul perfectly synched his drawing session to the event’s start and end time! Our boss man sat through the whole session, mesmerized, as simple lines and shades slowly turned into a vintage hot rod with a lady sitting atop it. 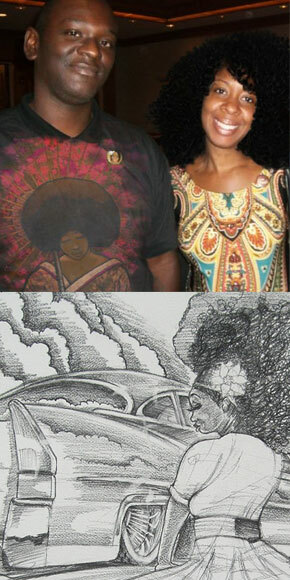 For Stitch, they are creating works centered around vintage hot rods and old school bicycles incorporating the words of your choice (the image to the left is inspired by: bicyclicious, eclectic, soul, and love.) 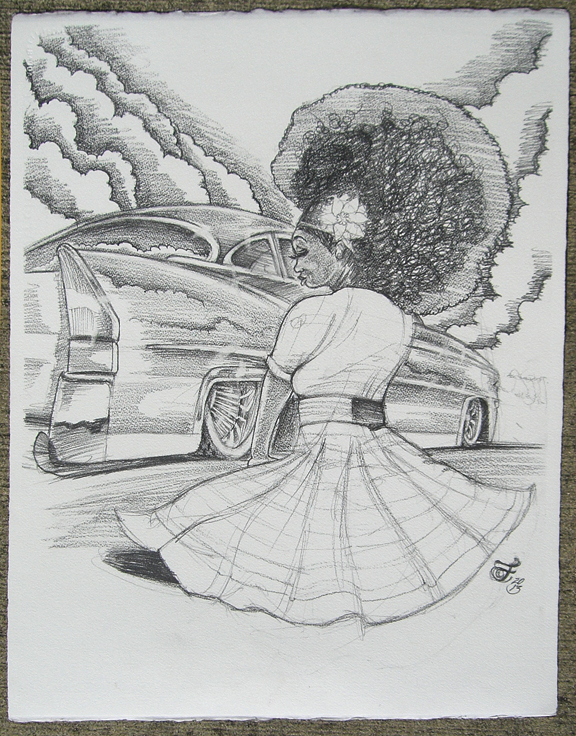 There are two rewards: 18″ x 24″ acrylic paintings ($175) and 16″ x 20″ graphite drawings ($125). The team will make two of each, so that’s four lucky folks who will take home these lovely pieces. 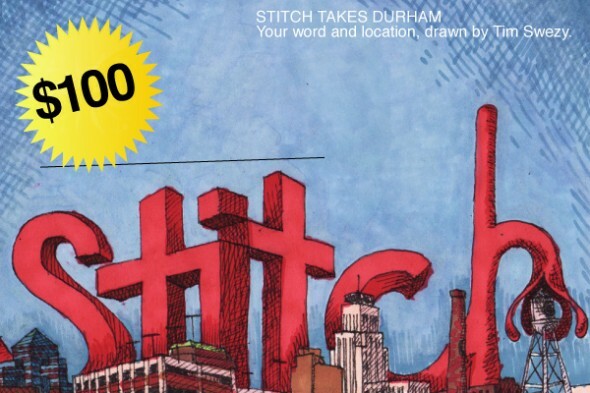 The team hopes that Stitch and its artworks “become the catalyst to create Durham-specific branding for the city that gets incorporated on buildings, on public transportation, new business, etc.” Let’s hope we can trigger something! And this just in: Jamaul will do a live-drawing session at our popup storefront event during the Durham Art Walk, on Saturday at 1pm!